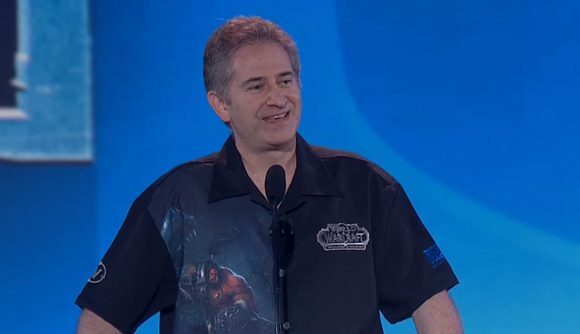 January 11, 2019 After moving from president to strategic advisor, Blizzard co-founder Michael Morhaime is leaving the company altogether. In October 2018, Morhaime stepped down as president of Blizzard Entertainment, to be succeeded by World of Warcraft executive producer J. Allen Brack. Morhaime stayed on as a strategic advisor, but according to a new form 8-K filing with Securities and Exchange Commission, he is now retiring from that role too. Update: he hasn’t left yet, but will do so on April 7 this year – an earlier version of this article didn’t make that clear. The news comes amidst a seismic shake-up of Activision, the other half of Activision-Blizzard. Several senior executives have left, and we learned last night that it is dropping Destiny, leaving Bungie to self-publish its social shooter, which had disappointed Activision (yet delighted fans) with its latest expansion. The company’s stock has been trending downward since October, with an especially steep drop after the poorly-received Diablo: Immortal reveal at BlizzCon. There have since been reports (via Kotaku) of Activision becoming more active in Morhaime’s side of the business – until recently it was thought that the two brands were kept structurally separate. Morhaime has been with Blizzard for 27 years, overseeing the company through all its history, whether that be RPM Racing, Warcraft, WoW, or Overwatch. He led the opening ceremonies at the annual fan gathering, which means his appearance at BlizzCon 2018 was his last.